We give customers easy and automated tools to analyze data, gain practical insights and initiate positive change. Our robust, user-friendly, mobile scanning devices put data collection best practices in the hands of the front-line employees. Our dynamic and customizable web-portal aggregates and visualizes data analysis and interpretation. What is the FleetAnalytix Solution? FleetAnalytix is a web-based data analysis platform with mobile capabilities. We give businesses the ability to better measure and understand the activity of their local workforce. A robust, user-friendly, mobile application puts data collection best practices in the hands of the front-line employees. A dynamic and customizable web-portal aggregates and visualizes data for analysis and interpretation. Ever wonder “Where is car XYZ?” With FleetAnalytix’s Where’s My Car tool, you can quickly track vehicles monitored by the system. Just enter a vehicle ID and you will see who, when, where related to that ID. Each mobile device comes with the ability to log items left behind by customers. Once wirelessly uploaded to the portal, users can view a picture of what was found, who found it, where it was found, and when it was found. Each mobile device comes with the ability to log damage found on a vehicle. Once wirelessly uploaded to the portal, users can view the issue logged, who logged it, when it was found, and see an actual photo of the issue in question. 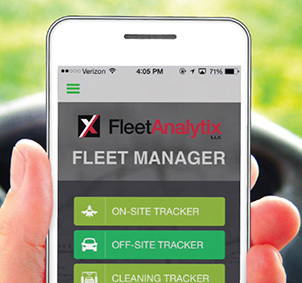 You get dedicated, powerful, knowledgeable support with FleetAnalytix; it’s all part of our standard product offering. One of our experienced account managers will work as an extension of your team, focused on the specific needs of your employees & business. Emergency after-hour, holiday and weekend support included as an extension of your team.